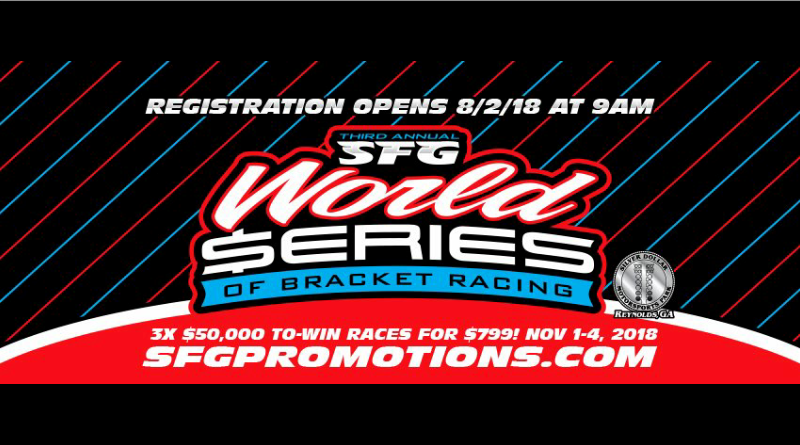 Watch The SFG World Series of Bracket Racing Live Online! REYNOLDS, Ga. – The 3rd Annual FTI Performance Word Series of Bracket Racing kicked into high gear on Wednesday at Silver Dollar Motorsports Park with a $15,000 to win bracket race. Originally scheduled to be a $5,000 to win event, the SFG Promotions team decided to up the ante and make it back-to-back 15 grander’s on Wednesday and Thursday. Those events will be followed by $50,000 to win races on Friday, Saturday, and Sunday. DragChamp.com is your source for daily race results from the World Series of Bracket Racing. For more information see the flyer below. Also, click the links below to watch the live feed from Motormania TV.